I don't know, but I've always felt at home in Princeton (NJ). Driving there this recent weekend made me realize how much I miss the area, the people and the shops. There's more shops now than I can remember. After all these years, the place still feels warm and homey. Although our visit there was short, it was a warm, relaxing, perfect Easter Sunday. 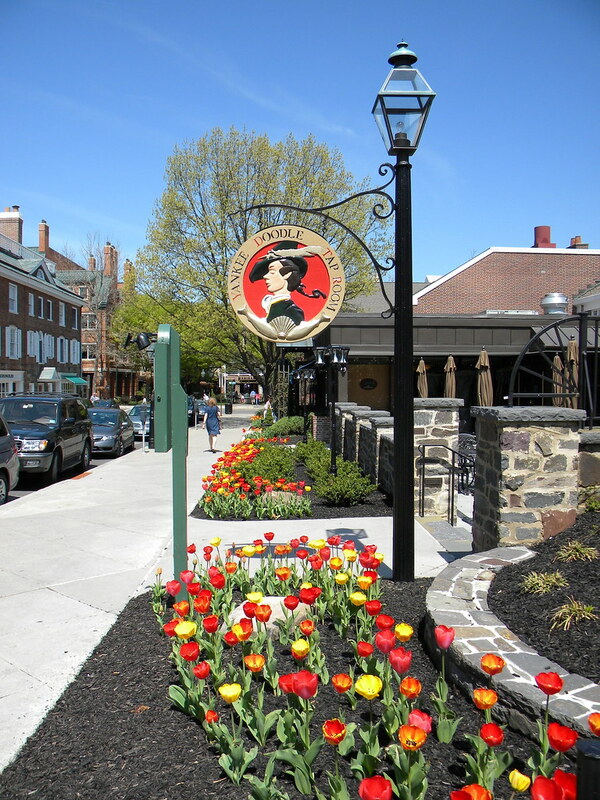 The Tulips adorn the entry way to the Yankee Doodle Tap Room. This is also my entry for Ruby Tuesday. Check out other entries here. Someday I'm going to do an East Coast swing so I'll able to visit all these lovely charming places. What pretty tulips. The place looks gorgeous. hey! how come i didn't see these in princeton?!? i can understand why you feel at home there...talaga namanng homey ang daying ng princeton! You can print your photos as postcards, really! you were in south jersey this easter weekend? meanwhile, i drove to bethlehem, PA saturday night into easter sunday. i've never explored princeton. actually, there's a lot about my own home state i haven't discovered! And what an adornment those tulips are! Dazzling!